Maintaining sanitary conditions in your place of business is vital to your success and community reputation. And when you or a customer steps into the bathroom to use the toilet, you expect a straight flush with no back sass. But sometimes sewage backup occurs, and in a worst case scenario black water can pour out like you just struck stinky rich oil. If not properly cleaned, a foul odor can remain for months and your customers may be hesitant to enter your shop when they have the option to go to a competitor right down the street who has golden plumbing. All too often business owners will attempt a sewage cleanup on their own in the quest to save money. But by understanding how sewage backup occurs and how professionals clean and restore properties to their previous condition, you will discover that calling a professional company that offers a free inspection and quote will be the better investment. There are as many sewage spill causes as there are possible hands in a poker game. But don’t expect to get a “straight flush” if a customer has flushed a diaper, paper towel, sanitary product or a hand full of expired coupons down your plumbing. Let’s face it; there are people in the world who simply don’t respect a public or business-owned toilet. Just because it isn’t theirs, some people won’t even think twice about flushing harsh products that, over time, can cause a blockage with amassing pressure that can unleash a black water spill all over your floor. Another common cause for sewage backup can be caused due to rust or mineral deposit buildup. In fact the city of Greensboro recently experienced a black water problem when a grease buildup in an 8 inch pipe caused 1,500 gallons of untreated sewage to spill forth. Business owners should also be aware of any trees growing in close proximity to their place of business. In many cases tree roots in search of moisture can find sewage pipes and grow right into them—causing a pipe burst that results in a black water nightmare. Can I Clean Sewage Myself? 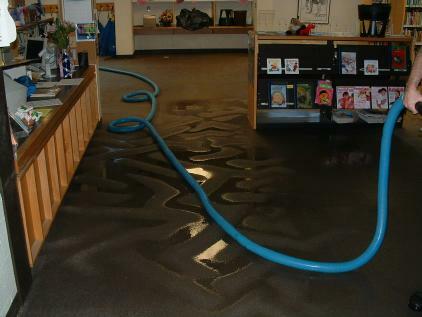 Anyone can attempt to restore a business after it has experienced a black water spill, but there are many reasons why this is not advised. First of all, sewage carries a number of toxins and bacteria that can cause people to become severely ill. A professional sewage cleanup company will come equipped with HAZMAT gear to prevent illness. Also, the professionals have industrial strength cleaning products and high powered equipment that will remove every ounce of contaminant and that will completely disinfect the area leaving everything smelling clean and fresh. Finally, only a professional restoration company can completely dry a room that has been doused in black water and then soaked in cleaning chemicals. If a room isn’t properly dried a business runs the risk of getting a mold problem (law suit waiting to happen), so having an industrial strength drier to restore the room is an absolute must. Your plumbing is like the heart of your business—it moves clean water up to your faucets and casts out waste. Your plumbing keeps your place of business accessible to customers and employees and, if maintained, it keeps your establishment sanitary. Since a business restroom gets significantly more traffic than any residential toilet, having your plumbing inspected once a year is a great way to safeguard your business from any potential sewage problem. Knowing that you will get a straight flush every time is worth the effort!